In the Middle Ages, nearly a million pilgrims a year streamed over the Pyrenees and made their way across the northern roads of Spain to pay homage to St. James, the patron saint of Santiago de Compostela—the third most holy city of Christendom. Pilgrims usually took shelter along the long road in sanctuaries, hospitals, and hospices that were built for this purpose with donations and legacies from wealthy patrons. 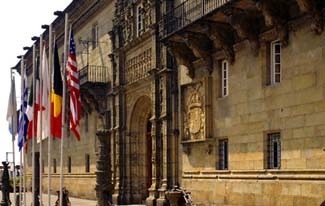 Not to be outdone, the Catholic monarchs, Ferdinand and Isabel, made a pilgrimage to Santiago and, dismayed at the condition of the ancient hospital next to the cathedral, resolved to “build a Hospital at our expense, which we intend to back with our own income, to receive and shelter the poor, the sick, and the pilgrims.” Actually, the money came from contributions and taxes from the land of Granada after the defeat of the Moors. To their credit, Ferdinand and Isabel took a keen interest in every step of the design and construction. Over a period of ten years they commissioned the greatest architects and masters of their time to plan every detail. Although the building was not quite finished, the doors finally opened to pilgrims in 1509. They opened again in 1958 to modern-day guests as a 5-star hotel. In general, the rooms on the third and fourth floors are choice. The hotel discourages sightseers. The plaza in front fills up with so many people at times, the spillover affects the tranquility of the hotel. The hotel has come a long way since its days of providing for pilgrims who had just slogged their way from France, over the Pyrenees, and across northern Spain. These days, the first few genuine pilgrims with compostela in hand who show up at a side door will be granted a meal in the employees cafeteria. Rates include tax and breakfast. Santiago de Compostela is in the far northwest corner of Spain and is accessible by all forms of transportation. The hotel is in the center of town on the main plaza. Located on Santiago’s main plaza, the Parador de Santiago de Compostela—sometimes called the Hostal de los Reyes Católicos—faces the cathedral, which can be seen from miles away. The spectacular structure looks more like a monument than a hotel. Its façade features a magnificent Plateresque doorway extending the full height of the buildings. Four large, open-air, interior patios feature gardens, fountains, and covered walkways. Columns support a gorgeous dome and 16th-century gilded wrought-iron grillwork. Paintings by El Greco and Goya grace the walls, while antiques adorn every room. Guest rooms range from simple rooms to lavish suites. One suite—which has been occupied by General Franco and various members of European nobility—features a coffered ceiling, oil paintings, and a fireplace. It is furnished with an ornate canopy bed, carved chests, and gilt mirrors. The restaurant, located in a large stone vaulted room, offers a fine selection of well-prepared Galician cuisine. Considered one of the oldest hotels in the world. Splendid location across from the catédral.